Electrically heated kilns are the origin of Nabertherm’s business since 1947. A wide range of electrically heated kilns is today available for different applications. 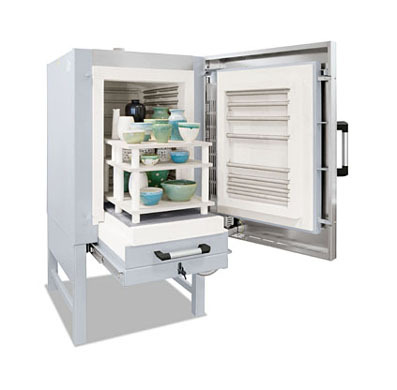 Beginning with top loading kilns for hobbyists or ceramic cafes we deliver also electrically heated chamber kilns for potteries, ceramicists, schools or even for laboratories or the production in the ceramic industry. All electrically heated kilns from Nabertherm are manufactured in Germany. We offer already with the standard version of each electrically heated kiln a compact scope of delivery, which allows you to focus on your art without studying kiln technology. An intuitive to operate controller is standard as well as energy saving insulation and fast switching, noiseless solid state relays for a very precise firing cycle. The most common electrically heated kilns are available from stock for a quick delivery. Thousands of schools and professional potteries especially in Europe burn their ceramics in Nabertherm electrically heated kilns. High finishing and state of the art technology is one reason but also the reliable and fast spare parts service. An engineering team of more than 40 engineers is designing every day the kilns of tomorrow.